Back in 2013, I decided to adopt the habit of exercising every day before work. You can click here for a separate article that I wrote on why morning exercise is on one of the strongest habits that you can form. In this article, you’ll learn four secrets on how to exercise before work, even if you’re not a morning person. Note: If this is your first time at StrongerHabits.com, you can also click here to take a free assessment of your current habits. The assessment takes less than 3 minutes, and you get your results immediately. You’ll also get 3 free videos on how to break bad habits and make good ones last. Secret #1: Go to bed earlier. If you get less than seven hours of quality sleep each night, of course you will struggle to get up and work out early the next day. Fatigue (not a lack of willpower or discipline) is the main reason why people fail to follow-through on a plan to exercise before work. Early-morning exercisers go to bed earlier. One of the leaders who I interviewed for Work Stronger is an executive in Alabama named Don Monistere. Don told me that he gets up at or before 4:00 a.m. each day to exercise before work. Want to know one of Don’s secrets? He’s in bed before 9:00 p.m. each night! You don’t have to go to bed before 9:00 p.m. (or get up by 4:00 a.m.) to work out before work though. Just work backwards from when you want to wake up and go to bed early enough, so you can get at least seven hours of quality sleep. As for me, I’m usually in bed these days between 9:30 p.m. and 10:00 p.m. That way, I can get eight hours of sleep and be exercising by around 6:00 a.m. If you usually stay up later than 10:00 p.m., you’re probably just hanging out, watching television, or scrolling through the internet. Are any of those late-night activities really essential for your success or happiness? Even if your favorite TV show is on after 10:00 p.m., you could record it and watch it the next day or during a weekend. Secret #2: Lay out every item the night before. This simple action increases your commitment to work out when you wake up. It also makes the next morning easier, and it prevents you from realizing at 6:00 a.m. that you don’t have any clean socks. Lay out every single item that you will need for your workout. This includes your socks, underwear, shorts/pants, shirt/top, water bottle, keys, ipod, headphones, etc. You could also lay out all your work clothes and any toiletries that you will use in the morning. Instead of searching for everything the next morning when you are half-awake, why not gather it the night before? 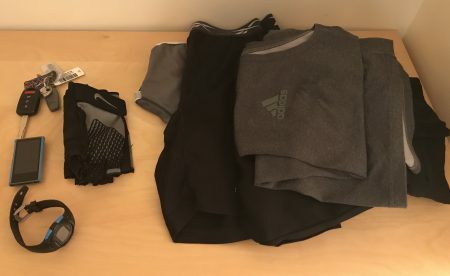 My workout clothes and equipment waiting for me when I wake up. 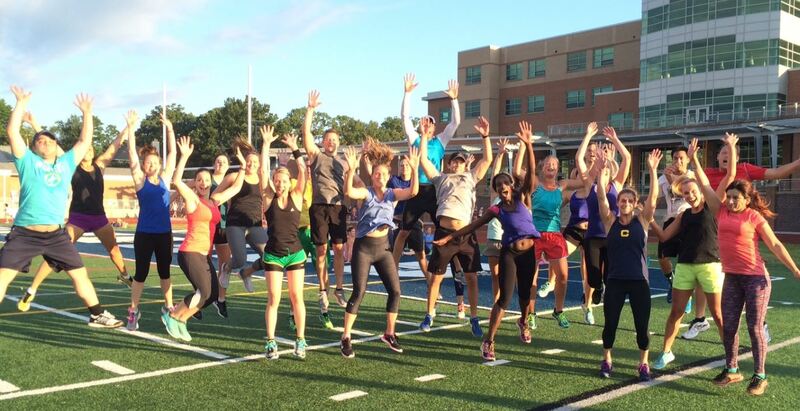 Secret #3: Plan or schedule a fun workout. If you have no idea what you will do for your morning workout (or if you are dreading the exercise that you have in mind), you’ll be much less likely to do it. This is especially true when it’s early, it’s dark outside, and your bed is warm and cozy. There are so many ways to be active and to make exercise more enjoyable. If you don’t like running on a treadmill, you could find a trail to run. Or, you could do a totally different kind of exercise, like cycling, swimming, jumping rope, dancing, or weightlifting. If you don’t like going to your local gym, you could find a new gym or you could exercise outside or at home. If you don’t like working out by yourself, you could find a friend, a family member, or a group of people to work out with. If you don’t like planning your own workouts, you could download a fitness app or register for a group exercise class. Never go to sleep without first deciding what your workout will look like the next morning. Make it fun, and you’ll be much more likely to follow-through. This photo is from another morning workout that I led. This one was in the winter. Secret #4: Keep your alarm clock at least 10 feet from your bed. It’s too easy to hit the snooze button if you just have to roll-over to do so. These days, I keep my alarm clock in my bedroom closet. That way, I have to get out of bed to turn it off. Once you’re out of bed, the hardest part is done. This is especially true when you got enough sleep the night before, you laid out all your stuff the night before, and you planned a morning workout that you are looking forward to. Wondering how to exercise before work? You don’t need to be a “morning person.” Anyone can form the morning exercise habit by developing a smarter bedtime strategy. The decision to work out in the morning is really made by what you do (or what you don’t do) the night before. P.S. If you enjoyed this article, you can share it by clicking one of the social media icons on this page. Is this your first time at StrongerHabits.com? You can click here to take a free assessment that measures your habits in four areas that have a major impact on how you feel and perform each day. The assessment takes less than 3 minutes, and you get your results immediately. You’ll also get 3 free videos (sent to you over the next week) on how to break bad habits and make good ones last.